In the beginning, there was Craps . . .
Craps has been around for a long time in one form or the other. It intimidates beginners like no other game in the casino. Craps doesn’t need to be this way, but all the options within the game overwhelm many. Here’s the thing. You don’t need to know everything to play and enjoy Craps. In fact, you could learn just one thing—the pass line—and play to win money. I hope you’re ready to learn some Craps, because our intro series to the game will get your started fast. I’ve broken it down into three easy-to-digest parts. Any tutorial on a game needs to start with the general game flow. In Craps, there’s what I call a cycle. First, there’s a come out roll. Next, a point is established. Next, the shooter rolls until that point is made or the turn is ended—by rolling a 7. Finally, a new cycle begins. Confused? Don’t be. We’ll go over all this. The shooter is the person with the dice. Each player in Craps gets a chance to roll the dice—if desired. The turns progress clockwise around the table. When it’s your turn, you are the shooter. Let’s imagine it’s now your turn. You grab those dice and you’re ready for action. Your first goal is to establish a point. A point is the numbers 4, 5, 6, 8, 9 and 10. Once you establish a point, the game/cycle officially begins. Your goal is to throw that point/number again before throwing a 7. If you do, you win. If not, you lose. There’s much more to the game, but let’s take it one step at a time. Okay, you have those dice and you just flung them against the back wall. What now? Well, if you throw a 7 or 11, all Pass Line wagers win and all Don’t Pass wagers lose—more on this later. Should you throw a 2, 3 or 12, all Pass Line wagers lose and all Don’t Pass wagers win—except the 12, which is a push. You’ll keep repeating this process until you throw a 4, 5, 6, 8, 9 or 10. Once you do, the point is established. A. This is the Pass Line. B. This is the Don’t Pass. C. These are point numbers. 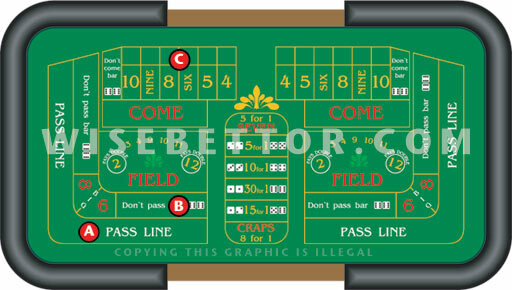 In the next section, I’ll go over the rest of the layout and show you more about the game of Craps. This entry was posted in Casino and tagged Craps. Bookmark the permalink.